I really love fish in parchment paper, it makes a beautiful presentation, it keeps the fish moist and very flavorful. When you open up the papillotte, you can smell all the wonderful aromas of the fish infused in spices. Papillotte is the word that we use in French cuisine that describe a method of cooking and that means to wrap what you want to cook in a foil, either aluminum or parchment. There has been some discussions a little while ago that aluminum was bad to use in cooking and could cause some health problems, so many people are using parchment paper for papillotte instead. The smooth cauliflower purée is a great accompaniment to the cod, it balances the spicyness of the dish. I added a few potatoes to the cauliflower to give it a smoother consistency et voilà, c’est prêt! You can enjoy and healthy dish, full of flavors and very low in calories. Cut cauliflower into florets. Steam cauliflower and potatoes together. When cooked, mash them, add all other ingredients. Keep warm. Shred carrots and zucchini. Slice the mushrooms. In a pan, heat olive oil, add onion and brown them. Add garlic, stir for a few minutes. Add curry powder and stir well to get the fragrance out. Add mushrooms, cook for about 5-7 minutes, then add shredded vegetables. Cook for only 1 minute or they will become very mushy. Add salt and pepper. Remove from heat. Divide equally the curried vegetables and place in at the bottom of the parchment paper. Add cod fillet. Sprinkle with a little curry powder, 1 tbs of coconut milk, salt and pepper. Tight the parchment paper all around the fish so that no air would get inside. Repeat the same process for the other cod fillets. Place cod in a dish and cook in a 375F pre-heated oven for about 25 minutes. Open the parchment and serve on a plate with some cauliflower purée. This entry was posted by silvia on June 30, 2009 at 5:27 pm, and is filed under Fish/Seafood. Follow any responses to this post through RSS 2.0.You can leave a response or trackback from your own site. I’ve never cooked fish in parchment. I have always used it when baking crostades. I should try doing fish in it. oh my goodness, that looks so delicate and delicious. i usually only cook with talapia, but i need to start branching out more with my fish dishes. i like using tin foil to trap in the flavors while cooking, but i’d be opening to using parchment instead. I just got a bunch of cauliflower in our CSA basket and I definitely want to try your puree– sounds great! A nice idea in keeping the flavor and moisture of fish. Thanks. 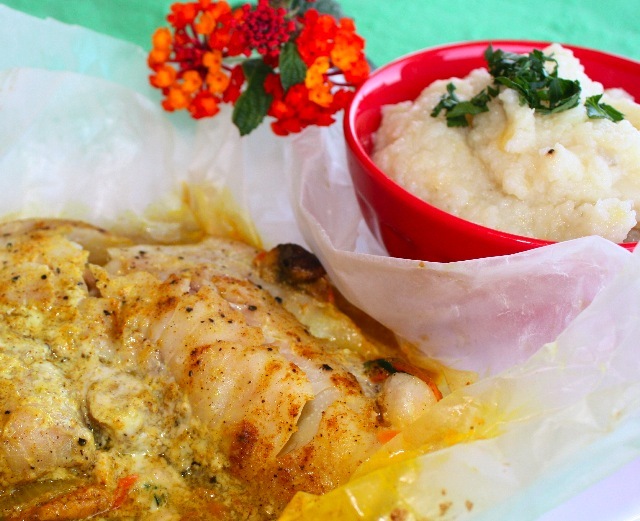 I adore fish cooked en papillote – so moist! With coconut milk and cremini mushrooms? Beautiful! My word. This is a fabulous combination I just have to try. Cauliflower puree is great with fish. Thanks for sharing. I have never cooked fish in parchment paper before and never added potatoes to cauliflower. A very creative dish and something that i would love to try. Thanks for the recipe post…I will definitely try this!!!!! I am a Chinese customer,I saw your website, Do you have vegetable parchment paper? I want to buy your vegetable parchment paper, Plant a white translucent parchment! A thickness of 40 grams gms ~ for the first time set out 10 tons a month after the scheduled 20 tons! Ask you to first send a4 pattern of five let us test! If we can put the oven temperature to 285 degrees on time 15-minute paper is not broken, Then it will, and we want 300 PCS (60 x 40 cm) made of paper bag, big bag-like ! Please reply to me quickly! thanks !